A good cauliflower recipe can be hard to find. I’m very excited to say that I’ve found another cauliflower recipe that is worth the “hassle” … which really isn’t that much of a hassle. Fry bacon, remove from pan, set aside on paper towels (in freezer to get extra crunchy), reserve bacon grease. Chop or pull cauliflower florets from base stem/leaves. Chop into 2-3 inch clusters. Preheat oven to 375. Flash fry paprika in bacon grease on low heat 3-5 minutes, or until paprika blends with oil and becomes sauce-like. Start by frying large pieces of cauliflower in pan 5 minutes (keep the little crumbles separate for now), stirring to coat in paprika oil. Transfer cauliflower to oven, adding small pieces, and bake additional 15+ minutes, until desired tenderness. Stir halfway to recoat cauliflower. I love cauliflower! I do hate it raw though. I will only eat it raw on veggie pizza and that’s only because it’s so small on veggie pizza. I usually buy frozen instead of fresh to avoid the crumbling issue but my favorite way to eat cauliflower is in place of mashed potatoes. We just boil it, and puree it in the food processor. Then add butter and sour cream. You can even make it loaded by adding bacon and sharp cheddar cheese. So yummy! 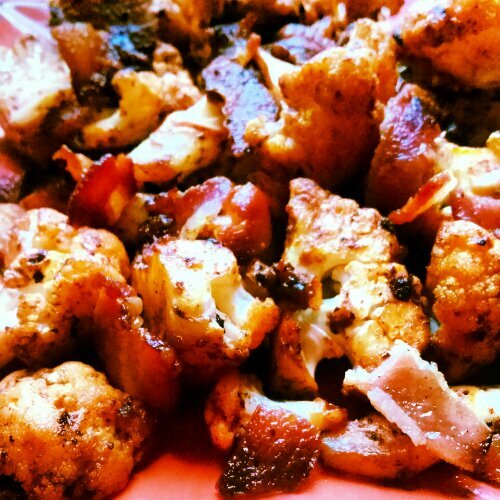 i LOVE the loaded cauliflower faux-tatoes with bacon and cheese. genius! Yum! You had me at “Smokey” – and then you had me again at “Bacon”!! Tough question! I’m from the woods, I definitely hug trees, and I run barefoot. So that would suggest a pronounced lean toward “Smokey”. But I LOVE things that are smoked, like real Smoky-Mountain Barbecue. Which would tend towards “smoky”. I guess I’ll have to leave that an open question. What do you think? I have to agree with all your points on cauliflower, I too am trying to like it. Since Bacon makes everything taste better I am going to try your recipe tonight. Thank you! the paprika, salt, and bacon really helped make it more exciting for my tastebuds!